A brighter smile can help you look and feel your very best, but many people try whitening teeth with store bought strips, pastes, and gels that don’t deliver the results they promise. If it seems like you’ve tried all of the teeth whitening products on the market and still don’t have the bright white smile you want, it’s time to call Dream Dental to schedule a teeth whitening and cosmetic dentistry consultation in our Woodstock dental practice. We will evaluate your smile and help you find the best professional teeth whitening options. 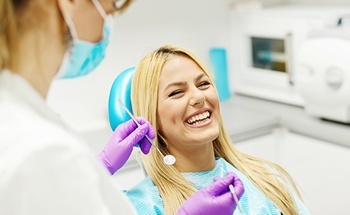 Why Should I Visit a Dentist for Teeth Whitening? Over the counter teeth whitening products promise dramatic results, but they are typically unable to deliver the flawless white smile you deserve. Professional teeth whitening, in-office or at-home, addresses the two major issues that cause store bought whitening products to be ineffective. First, the application methods of over the counter whiteners are ineffective because they’re not fitted to your teeth. This allows neutralizing saliva to access the whitening agent and halt progress. The active whitening agent is kept at a very low dosage to ensure patients don’t unintentionally damage their smiles. Combined these two issues lead to store bought whiteners being almost completely ineffective. We offer both in-office and at-home teeth whitening. In-office whitening can brighten smiles up to ten shades in just one treatment visit. We isolate the soft tissue and lips using protective shields. Then, we apply professional grade teeth whitening gel and allow it to work for about twenty minutes. After the twenty minute application, we will check the progress and reapply as necessary until you achieve the desired results. At-home teeth whitening uses custom crafted application trays fitted to your smile to apply professional-grade whitening gel with a dosage adjusted to your unique teeth whitening needs. You can achieve the same results possible with in-office treatment over the course of ten to fourteen short, daily applications. How Long Do Teeth Whitening Results Work? Most people need to touch up their results a few times each year to maintain the brilliant white appearance. With regular touch ups, your smile will remain flawless for years. Without at-home touch up treatments, you’ll likely need to undergo retreatment every few years. 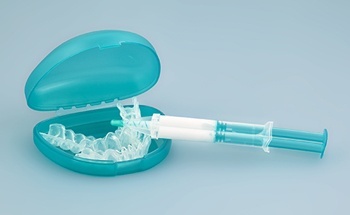 The best way to extend the life your whitening results is to take proper care of your smile. 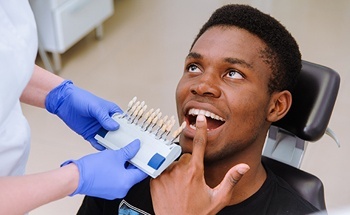 Daily brushing and flossing and regular dental exams and checkups will help to keep your smile bright, but to maintain your results you may need to adjust other habits as well. Smoking and tobacco usage can lead to severe staining as can consumption of darkly colored foods and drinks. Avoiding these products can help you keep your smile brilliantly white.